Fans may have noticed a towering presence missing from the Little Giants’ defensive line this fall. 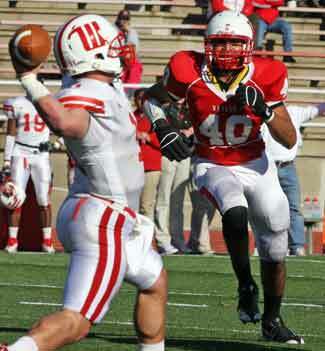 Junior defensive end Jorge Diaz-Aguilar has seen limited action after he tore his meniscus early in training camp. The injury caused 6-foot, 6-inch Diaz-Aguilar to miss the rest of training camp and the team’s first game. He was cleared to play the following week, but has been eased back into his starting role. The Kappa Sigma member thinks he’s close to full recovery. However, he and the coaches are still being cautious. Players and coaches are not the only ones to miss seeing Diaz-Aguilar on the field this fall. His mom misses it too. 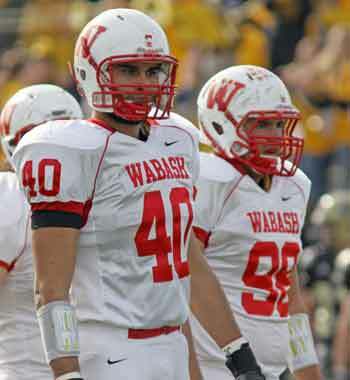 In fact, one of the reasons Diaz-Aguilar chose Wabash was so he could stay close to home so his mom could see him play. Diaz-Aguilar is a Psychology major with a Spanish minor. Even though Spanish is his native tongue, his minor is not being used as a GPA booster. His motivation to help Latino boys and girls comes from personal experience. When he was four, his dad found a job in South Bend. Diaz-Aguilar, his father, mother, and sister left their family in Guadalajara, Mexico for northwest Indiana. As a young boy, Diaz-Aguilar and his friends had a difficult time communicating in school. “I was placed in the ESL class as a boy with a lot of other Latino kids,” he said. “I witnessed the struggles my friends and I faced in speaking English. At home, we would only speak Spanish. Fortunately for Diaz-Aguilar, he had his mom, Rosalina, to help him learn. Rosalina was more than a teacher to her only son and daughter. For now, Diaz-Aguilar’s involvement is the football team and Sphinx Club. He’ll be involved in the middle of the action Saturday in an important game at Wittenberg.